The 2011 Christmas/Holiday dinner was held at Jägerhaus Restaurant, 2525 E. Ball Rd. (just west of the 57 Freeway) in Anaheim, CA. After dinner an opportunity drawing with some great prizes was held. Congratulations to Dan – N6PEQ who won the two top prizes this year, one which he immediately gave to his wife Kristin – K6PEQ. 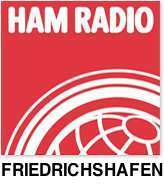 Our own member Peter Putnam - NI6E gave a talk on his recent trip to the Friedrichshafen HamFest in Germany (Friedrichshafen is located about 275 KM SSW of Eckweiler, Germany and 169 KM S of Goeppingen). At the November meeting the club also held elections for the 2012 Board. A list of elected officers is presented in the December 2011 RF Newsletter. The yearly October club auction was a grand success. Numerous sellers brought enough equipment to keep auctioneer Chip - N7JA working past 9 PM. There were also a lot of equipment donated from members and the estates of past members including WA6VKZ and W6OGX. Only a few items did not sell. PACIFICON presented the 2011 ARRL Pacific Division Convention at the Santa Clara Marriott Hotel. Those who didn't get to attend could follow some of the action on Leo Laporte's KFI Tech Guy radio show for October 16th. Leo - W6TWT broadcast live Sunday from the convention. To listen to the show click here. For more information on Pacificon click here. Many members of the club, spearheaded by Jeff - W6UX and Tim - K6GEP operated "Portables in the Park" in conjunction with the California QSO Party. The team netted over 600 QSOs, running from about 9:30 AM till dusk. For more information see page 5 of the August or page 3 of the September RF Newsletter. Marty Woll - N6VI, Vice-Director of the ARRL Southwestern Division, was our September guest speaker. He talked of current developments in Amateur Radio and the ongoing efforts of the League on the behalf of US amateurs. Marty also gave us an update on the antenna restrictions in the Lancaster and Palmdale areas of Los Angeles County, and answered questions from the members. HAMCON Inc. presented the 2011 ARRL Southwestern Division Convention at the Marriott in Torrance, CA the weekend of Sept. 9th - 11th. Phil Pacier - AD6NH of HRO in Anaheim talked on APRS and its advanced features at our August general meeting. Phil is a long-time user of APRS and has helped many hams set up their systems. In years past, he has set up his system to monitor the runners in the Baker to Vegas run. 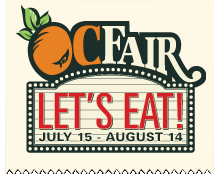 Each year the Orange County Council of Radio Amateurs (OCCARO) sponsors a ham radio booth at the O.C. Fair. The OCARC supported the booth on July 20th (Wednesday) and again on August 6th (Saturday). During the Saturday session Amateur Radio tests were administered, many successfully. The booth was a blue ribbbon recipient. Brenden Geary - KJ6HVP is a school science fair winner and will be competing in the state science fair. He is a 14 year old 8th grade student with a very impressive hobby. Brenden talked on the flights of his weather balloons carrying payloads such as a 2 meter and 440 MHz cross band repeater, GPS, still camera, and video camera, which he designed and built. Brenden's last launch reached an altitude of over 97,000 feet elevation. The Orange County ARC participated in the ARRL Field Day for 2011. Check our RF newsletter and on our Field Day webpage for results. 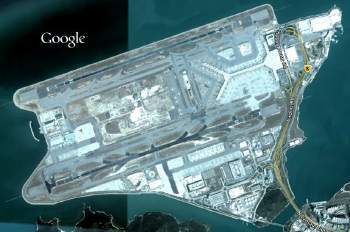 Dennis Kidder - W6DQ presented a program on the construction of the Hong Kong Airport. While the topic is not ham radio related, Dennis did manage to relate it to our beloved hobby. With stormy weather pending last October, Dan and Kristin had to cancel the Halloween BBQ. The rescheduled get together (sans Halloween costumes) was held at the PEQ's QTH on Saturday of the Memorial Day weekend. A large contingent of club members, their spouses and friends enjoyed an ideal afternoon socializing, working some DX, and enjoying lot's good food and and drink. Mother Nature must have heard the old adage "It's not nice to rain on a PEQ event"
Amateur operators John Freichs - N6VCW and William Phinizy - K6WHP presented a very informative talk on the mission of the Civil Air Patrol (CAP) and how amateur radio is used in their operations. Many of our more avid DXer club members including N6PEQ, K6PEQ, W6GMP, N6VNI, KC6TOD and many others made the trek to Visalia for the annual International DX Convention. The April meeting program was a 58 minute video on the 2007 DX-pedition to Scarborough Reef in the South China Sea west of the Philippines. The reef is one of the rarist and most contoversial DX entities. Many club members were in Visalia for the DX Convention, or assisting in the Baker-to-Vegas race, both scheduled for the weekend of the 15 - 17 of April, however attendance at the meeting was still good. Preliminary Field day planning was also discussed. No opportunity drawing was held. A group of club members including W6HHC, WU6U, and AF6CF provided communications support to the Orange Police Department at the Baker-to-Vegas 120 mile relay race. The OPD [unofficially] finished 61st overall, and 7th place in their category with a time of 16:13 and with no penalties. A total of 261 law inforcement teams participated in this year's event. For more information on the race iteslf click here. Our guest speaker for the March meeting was Captain Steve Snyder - KI6EYQ of the Santa Ana Fire Department. 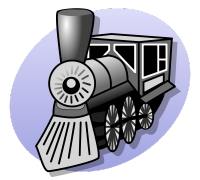 Steve spoke on the newly organized group of Santa Ana radio amateurs established to assist Santa Ana in times of emergency. The Santa Ana Response Team or "SART". Steve also talked about their Field Day plans to be held at Centennial Park. The Yuma Hamfest and Emergency Preparedness Show was held Friday and Saturday at the Yuma County Fairgrounds. Janet Margelli - KL7MF gave a really great presentation on the history of HRO (Ham Radio Outlet). There is a lot of history behind the largest ham radio store chain, and it all began in California with W6RJ and later N6RJ. 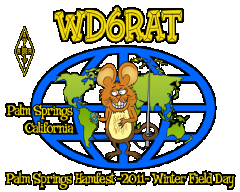 The Desert Rats and the Palm Springs DX Club invite you to the ARRL sanctioned Hamfest - Raffle - Winter Field Day. The January program was presented by Scott Byington - KC6MMF, of OC RACES, on the WinLink System." The County of Orange RACES and several other RACES/ACS organizations in the county are involved in a very large Packet Radio project. Currently, WinLink is being deployed in many of the EOCs throughout the county. At the January General meeting we learned what WinLink can do for Emergency Communication units. [ ** ], Nov 12, Oct 8, [ * ], Aug 13, Jul 9, Jun 11, May 14, Apr 9th, Mar 12th, Feb 12th and Jan 8th. * No Breakfast was held September 10th due to the ARRL SWD Convention being held that weekend. ** No Breakfast was held December 10th due to the December 9th Club Holiday Party.